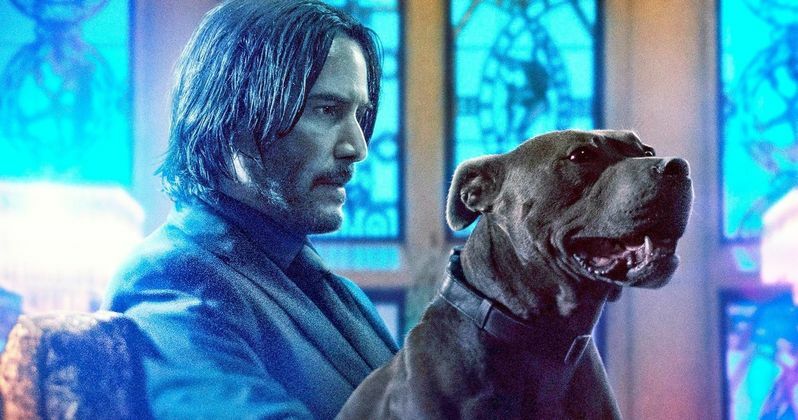 John Wick 3: Parabellum has released a new video to celebrate National Puppy Day. National Puppy Day was founded in 2006 in an effort to get people to visit animal shelters and adopt dogs, rather than get them from a pet store. Since then, the day has been recognized globally to celebrate the good boys and girls of the world and the John Wick franchise might know a few things about adopting dogs to bring them into a new family. The new John Wick 3 video celebrating dogs is rated GB for Good Boy, and contains "some intense barking." However, there is no barking to be found as it tells the love story between our favorite assassin and his new unnamed pit-bull companion. The minute-long video shows the adoption process all the way to living life with an assassin, but it never reveals the dog's name or mentions Daisy, Wick's first pup that didn't make it out of the first movie alive. John Wick 3 is going to feature the assassin's latest dog along with Halle Berry's two Belgian Malinois dogs. There has been some speculation that another dog could die by the time the third installment concludes and fans are not looking forward to that moment at all. However, that has not been confirmed officially, so all of the dogs may make it to the end of the movie without any issues. That seems like it would be the best outcome for all John Wick and puppy fans. Plus, Sophia's dogs look pretty vicious and are sure to take care of business. Even dogs like the John Wick franchise, which should really say something and be celebrated on National Puppy Day. With that being said, dogs aren't going to be paying to see the movie in theaters, unless they're some of those lucky therapy animals. In order to get more humans into theaters, Lionsgate has also released another new poster for John Wick 3, which states, "every action has consequences." The image looks like Wick has traded his New York surroundings for some sunshine and palm trees, but we all know it's not going to be that easy for our favorite assassin to get away. John Wick 3 just released its second full-length trailer, which might even be more intense than the first trailer was. That sounds hard to believe, but director Chad Stahelski has promised that the third installment will be the most bloody of the entire franchise, and the promotional material definitely showcases the director's promises. The movie hits theaters on May 17th, which is just right around the corner, which means that the second trailer is more than likely the last comprehensive look at the sequel that we'll have until the movie debuts. Thankfully, the wait is almost over. While we wait, you can check out the National Puppy Day video below, thanks to the Lionsgate Movies YouTube channel.